The Story Of The Ghost: Baba Harbhajan Singh A Dead Soldier still on duty !! 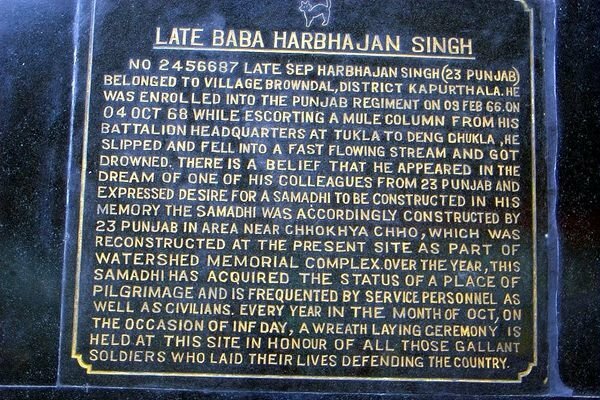 This is the story of Baba Harbhajan Singh, an Indian Army soldier, who died in 1986 but his ghost is believed to still be protecting at the border. Believe it or not, military mythology is a thing. Maybe when it comes to serving your nation, the soldiers never actually die!! He Born in a village of Punjab in 1941, Harbhajan Singh joined Indian Army in 1956. In 1965, he was granted a commission and was posted to serve with the14 Rajput Regiment. It was in the year 1967, near Nathu-La pass in eastern Sikkim. It is believed that he drowned in a glacier while trying to lead a column of mules carrying supplies to a remote outpost. His body was recovered after three days and cremated with due honors. But did he really die? Baba Harbhajan Singh was born into a Sikh family on August 30th 1946 in the village of Sadrana in district Gujjarawala Punjab (Pakistan). In June 1956 he enlisted as a soldier in Amritsar and joined the Corps of Signals. On 30 June 1965, he was granted a commission and posted to the 14 Rajput Regiment. Many News channel and Media has reported this, check out AaJ Tak Report on baba Harbhajan! !